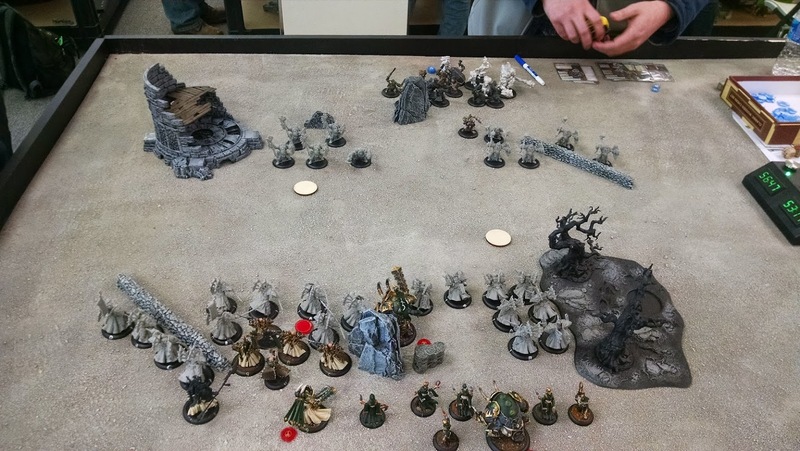 at the last tournament I was in, playing Cryx, I faced Gary Fortenberry round 1. He was running Bradigus and Kreuger 2. This time, He came to play with Haley 2 and Caine 2. Gary loved to use powerful casters, and this grouping is no joke either. 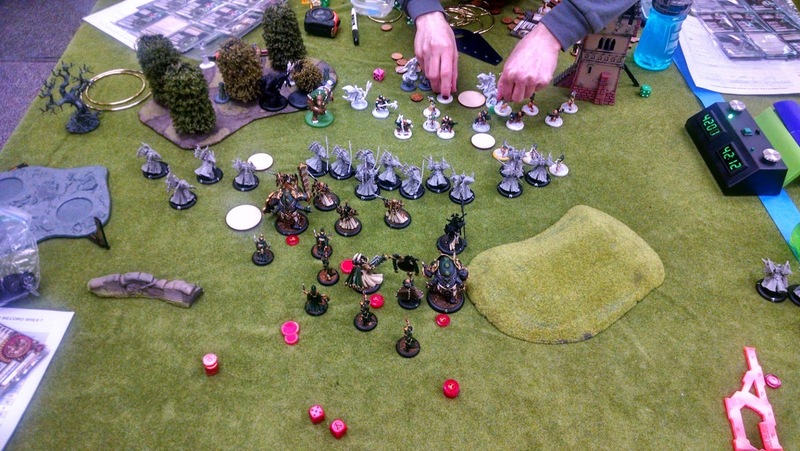 I had determined earlier in the week, prior to the tournament, that my best bet was to drop Rasheth in round 1, and see if I could eck out a win, instead of being trapped into him in the last round of the tournament, and use Fist for the rest of the day. I figured ol’ Tubby could try and tank any ranged assassination that came his way, so dropping him into the matchup probably wasn’t going to end terribly. Gary Picked Haley 2’s list. Just like last time, we were playing Destruction in the first round. I will say that a number of these tables are more open than I enjoy. The place we were at didn’t have a terribly wide selection of terrain, so we made do with what we had. I took the first turn and wedged forward. As I mentioned in my last article, I had a thought about how to run these guys, and I felt it really paid off. Arm 21 and 20 up front, big beater counter-chargers in the middle and support/cleanup in the back. This is a list that I really enjoyed running. The game only lasted until turn 3. 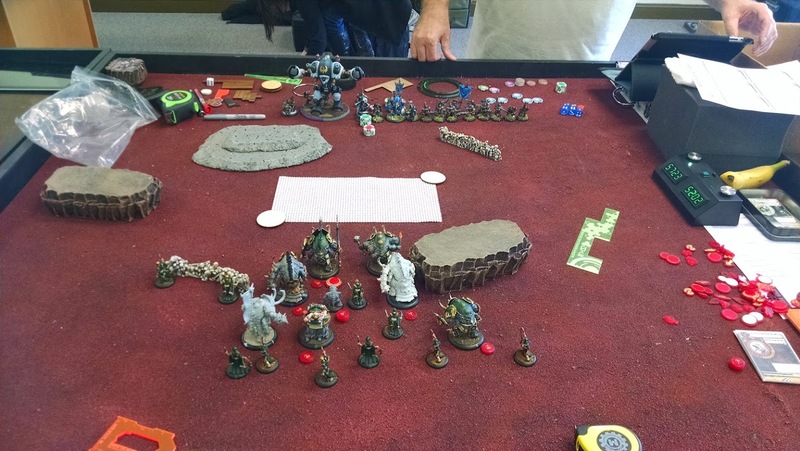 He gunned the Stormwall into the zone at the bottom of turn 2, getting off espionage with Anastasia and activating almost everything twice, as well as popping his feat. I’d even tried to prevent Anastasia from being effective, spending a Paingivers life to drop a Breath of Corruption that couldn’t deviate off of her, but the dice came up out of my favor. I just realized we counted in Deceleration, which does not help against magic attacks, but I believe I rolled up a 2,1,1, and it wouldn’t have made any difference. Though I seem to remember doing 3 damage.. ah well! what happened, happened. On the Feat + Espionage turn, I had thankfully gotten the Agonizer into range of the Stormwall, so Rasheth was going to live through the turn at least. What did happen, though, was that my Cannoneer got charged, twice, by nearly the entire unit of Stormblades, and somehow managed to survive, the Bronzeback had counter-charged up into the Stormwall, who had come in to finish off the Cannoneer, doing so handily. Haley moved up, touching the Stormwalls left field of fire, scooting deeper and deeper to get her feat on my entire army. Gorman, Madelyn, and a number of other models ran interference to try and protect her. While the feat turn only removed the Cannoneer and the Agonizer, the follow up was going to be bad. It was now or never. Gary made me activate my models in all sorts of terrible order, as is his prerogative under her feat. However, when it got time to activate the Bronzeback that had counter-charged into the Stormwall, I was feeling pretty good. I put up Trainwreck, and started going to town. The First victim was the Stormpod. Beatback closer to Haley. Then Gorman, Closer to Haley. Then The stormblade in front of Haley. Closer to Haley. Now I had to buy an attack on the Journeyman, because I was just the barest touch out of melee with Haley. Closer to Haley. Now in base with Haley, I Buy an attack, boosting to hit, connecting with her. She is sitting on one focus and Arcane Shield, so I boost to damage. Its a solid hit, but not good enough, and she takes 10 damage. We move on with my turn and finally get to Rasheth. I had kept the whole stack, and was ready for this. I moved forward my 4″ to just get the Bronzeback within the 10″ range of my Breath of Corruption, and tossed the spell at his back. Rear arc on a Bronzeback in melee is only 14, but I boost anyway. Don’t want to miss. Direct hit, and I boost to damage, doing 6 more damage, removing her from the board. I loved running that list, but I wanted to get more practice in with my Fist of Halaak list. 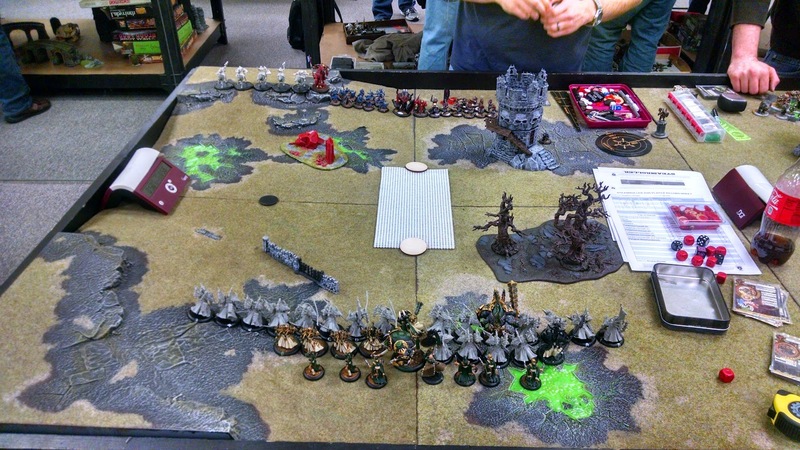 So while it was a decisive victory for the Skorne Empire, the rest of my games for the day were with Fist. I love getting games in against new people, and tournaments are a great out for that. This game was against someone I’d not even heard of, let alone played against, and I was extremely pleased to be across the table from him. He’d been taught by one of his friends, a Khador player and former MTG Grinder (and, spoiler, eventual winner of the tournament). This guys fundamentals were extremely sound, and he knew the rules in the right order. One of my biggest indicators of intimate rules knowledge is sprays. You make all your attack rolls first, and then all your damage rolls second. While it might not come into play all the time, it does often enough that you want to get into the good habit of doing it right. This guy did it without prompting and after telling me he’d only been playing for just under a year. Also, he was playing Meat Mountain. This round was close quarters, and I have come to believe that his scenario is a false choice: Always go for the opponents flag. Dominating your flag is good, and can score points, but dominating for 2 points, being on their side of the board, and putting pressure backwards is a much better position than being on your side of the board, dominating for one, and trying to put pressure forwards all at once. So, I ended up with first turn, and ran everything out there. I think I took second turn a whole once the entire time I was playing. This game ended up being a massively awesome grindfest. I managed to pick off some of the warders early with Incindiarii, while setting myself up in position to contest both flags for the whole game. On the bottom of turn two, he feated and rushed into me, killing a number of my frontline Incindiarii and Arcuarii. My Counter-feat, though, was brutal. I killed all the champions, almost all of the warders from both units, and set up for a run at Mulg. He denied me the run at mulg, but it looked like I could get Tiberion to Grissel. I really wanted to stay safe, however, but the Axer refused to be dislodged from his flag, and I felt it was worth going after Grissel. I was definitly in range with Tiberion, and his massive P+S 23 club came crashing down on her head for what I hoped would be a bajillion damage it turned out to be not as much as I had hoped, doing only 14 to the Axer from the transfer on a dice +6 charge attack. Mulg, due to protective fit, wandered his massive self over to Tiberion and gave him a whallop. Tiberion, now with his original target in sight, decided to make the most of it and tried to beat Mulg To death. I thought about Crit-smiting him away, but Grissel had 2 more transfers, and I didn’t want to risk getting beat to death by Mulg, and leaving Grissel alive to boot. However, at Dice +4, and 4 attacks with the main weapon, I wasn’t able to take out Mulg. I believe I left him with 3 HP. Mulg then Handily removed Tiberion, and we went back to beating the living tar out of each other. I did manage to clear out the Axer, though it took Xerxis getting his hands dirty to do it, and Mulg was bearing down like a freight train. I had the flag dominated with 2 points, but I didn’t know how long that could stay that way, though there was little to really worry about after my Gladiator Grand Slammed Mulg and beat him to death while on the ground. However, Grissel was looking askance at Xerxis, and he didn’t like it. 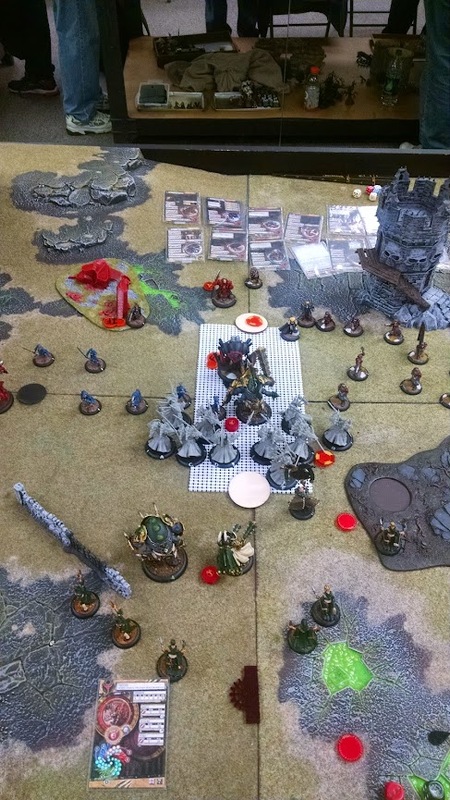 With no transfers because her beasts were all dead, Xerxis charged her and made to end the game then and there. The Charge attack fails to drop her, but the follow up with the second attack takes her to the earth. But he is trollbloods, and he toughs. A buy my first attack and club her again while on the ground, Tough again. Having spent 2 Fury here to take her down, and with armor 17, I was confident I was within reach of the victory. Dice -3, 3 attacks, and one of them needs to fail tough. The odds are ever in my favor. But the dice are not. My next three damage rolls come up 3. 2. 2. Grissel proceeded to stand up and beat me to death, which wasn’t necessarily very nice. This game was extremely fun, but had a completely crushing ending. I felt I had that game solidly in hand. Though there were ways I could have played it safe, the chances of me rolling the numbers I did when I did were extremely small, and the chances of him succeeding on both the touch checks are pretty low. I’m an aggressive player with an aggression dial cranked up to 11 that many times has served me well. This time, It didn’t. Now, days later, I’m ok with that, but on the spot it was really depressing. Would I do it again given the chance? 100% of the time, every day of the week. Stop hiding behind your flags and go kick someones teeth in! Sadly, in the pre-game discussion, talking about who we were and what we did, I mentioned that I’d been playing the game for a long time, 10 or so years. This seemed to rattle her, and along with the pressure of the clock and using new models, I could tell she wasn’t enjoying herself. It was, especially as a PG, exceedingly hard to watch. I we talked a little about it, and decided to stop the clock and just play until the last game was done, and call it on the spot. At that point, she became much more relaxed and, as I talked to her about both our armies and what they did, what they were good at, ect, everything kinda worked itself out. While we recorded the game as a win for me because she “clocked” the game was much more enjoyable without the clock. Sometimes, you have to turn your inner competitor off and just have a fun time. John Connor. Savior of the human race and talented warmachine player, and I have the pleasure of having him in my meta, for now. He’s played Khador for a long, long time now, from the ascension of the high defense army right on through to today, and he’s good with it. As we were both out of contention, we kinda just chose whatever list we wanted, without a ton of consideration for best matchup. He wanted to use his outriders, so he picked up his Butcher 1 list, and I picked up fist, having vowed that that was a thing that was going to happen for the rest of the day. Thinking about it, this list has almost no reach models, and I could have had a grand time with Breath of Corruption on my own models with Chain Gang. But, it was not to be. This game, unlike the others, didn’t even pretend to go my way, except on the top of turn 2. I managed to drift 2 of the 4 Incindiarii shots into the Nyss, killing four of them instantly and lighting Cyleana on fire, even though it went out the following turn. However, his turn two Feat in retaliation killed all of my Incindiarii and almost all of my Arcuarii, which I was none-to-pleased with. From then on, it had to hinge on my Cetratii, Tiberion and my Gladiator. I was unable to really break the Nyss defense after the Incindiarii went down, and even Tiberion was having problems with connecting when boosted. I had a chance to clear the zone, and score, but the stubborn, dodgy Nyss were having nothing to do with it. Honestly, I have no idea how the meta survived the High Defense times, because nothing seems to be as frustrating as watching your models do nothing all game. Above is the turning point, from which the game never even has a chance to recover. The spriggan, with P+S 21, has charged Tiberion yet left him alive. (notice that one Nyss in the zone, that one that kept me from moving ahead with my gameplan? yeah… ) However, I had not pulled enough fury from Xerxis to enable me to leech everything from Tiberion, who was sitting on four. With baited breath, I rolled the dice, needing an 8 or less. boxcars! Tiberions Frenzy blew up my chance at a game. I was going to try and get around to the objective, A&H, and the Spriggan and blow them all up (likely), and then threaten Butcher with a Tiberion to the face, and if he killed Tiberion, Xerxis. It was all not to be, though! The Triple 6’s for the damage on the Frenzy attack was moderately cathartic, but not enough. John spends almost his entire clock over the next few rounds grinding me into dust, but I don’t make it easy. He wins on scenario with 1:24 second left, and we even made a mistake with scoring, so he would have had to take at least a 15 second turn. I had over 20 minutes left on my clock. It was a glorious game, but man did I feel over-matched. High Defense is a giant pain for both my lists, and I think I need to do something about it, though I don’t know what. I was salty at the end, and John, if your reading this, it wasn’t at you. Instead, it was at my dice being uncooperative. They definitely were rolling average, just not where I needed them to. At this point, its past 9pm, and we have another round to go, with 2 hours on the deathclock. I choose to stay, because I get very few chances to play games of Warmachine anymore, so these days are it. 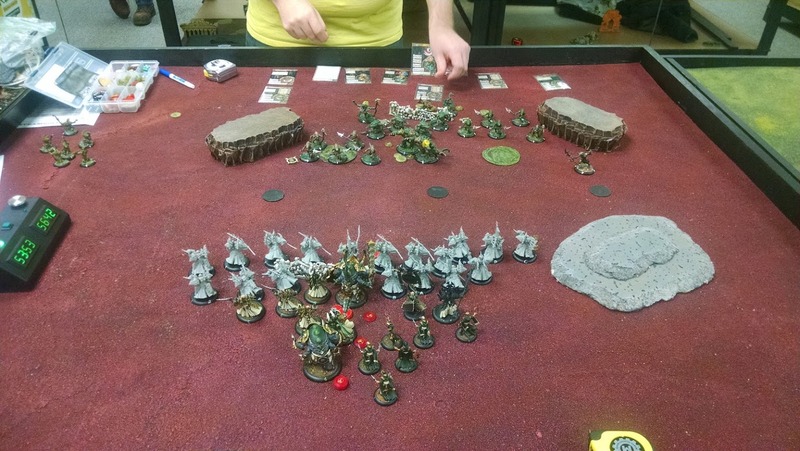 My opponent is a common player around our area who up until recently played Khador. He switched over to Minions, and I can’t hate him enough for it. Three units of Gators is insane to chew through. This game was a complete insane-grindfest like I’d not ever seen before. I managed to thin the horde out a little with a direct shot on the totem hunter with the First incindiarii to shoot at him in range, though it didn’t kill him, it lit him on fire. I also used the left flank Incindiarii to light a bunch of gators alight and burn at least one of them off the board as well. Pleased, I set up to receive the charge to the face, which rightfully happened. Some of the Arcuarii and Incindiarii perished, though not as much as I’d expected, and Tiberion, late as it was, forgot that one of the Wrastlers had admonition on it, making him very sad. The next turn, however, was great, as Tiberion was able to blow up both Wrastlers, and I sunk my teeth into the entire gator army. Nothing was to last forever, though, as the Posse with Fury came in and Tore Tiberion down in response. This game went back and forth like that until the very end, well beyond what I thought a warlock with no heavies could endure. Xerxis had to get his hands dirty at the end, and a miss measurement of .5″ left my fully riled gladiator out of Control Area, which then frenzied and charged even further out of my control area didn’t really help. Overall, Andy was an amazing opponent who wore me down and taught me to respect Rask. I can’t wait to get him back from the painters and toss him on the table, though I want to have a ton of bog trogs to do that with. Speaking of which, There were two very enjoyable aspects of this game that I want to highlight, even though its drawing on both in length and time of day. When the bog trogs came onto the board, I was worried about what I could do to them. However, having a 15/18 Caster with MAT 8 is a significant advantage when it comes to killing DEF 12 troopers. I was able to charge over to the trogs and beat more than my fair share to death and even had fury left over at the end. The second is that the Tyrant Commander flag in this game was completely clutch. Nothing like having your beast handlers immune to terror with three units of Gators bearing down their neck! I loose the game, getting eaten by a Gatorman Posse member after not being able to rile up the Gladiator and leech correctly for some 3 turns. 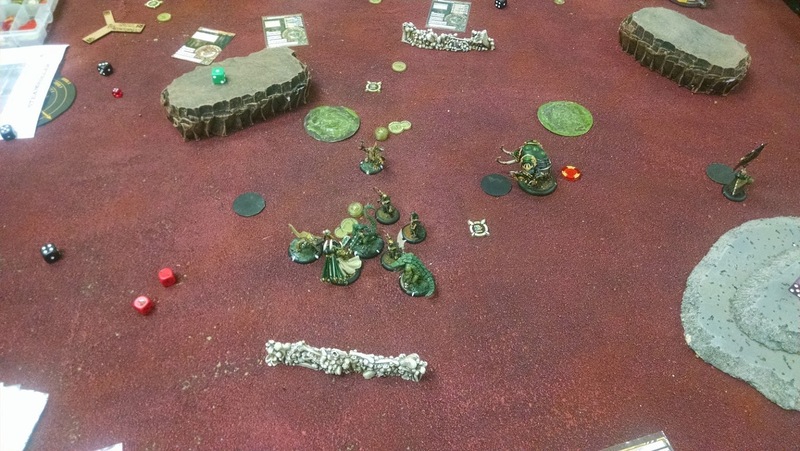 The Paingivers tried to play MVP, dealing 5 damage and slaying what I though was going to be the last gator threat on the board, but it was not to be! Final Tally: 2-3, though the fun was worth all the stress. At least, it seems like it 3 days later! Join me Tuesday as I break down the Fist List and analyze what I did wrong, what I did terrible, and what I can do or may do to get better!